Maize will travel to Haysville to take on the Campus Colts in a key Ark Valley Chisholm Trail League game that could determine who might challenge Derby for the league title. Maize, ranked fifth in Class 5A, has rolled to a pair of 49-0 victories to open the season over Valley Center and Hutchinson. The Eagles are led by senior quarterback Caleb Grill. Grill, who holds multiple D-1 basketball offers, has been really good this season. Last week, Grill passed for 205 yards and four touchdowns in the win over Hutchinson. Grill has help in running back Caden Cox and receivers Cameron Grimes and Deriq Doty. Cox rushed for 110 yards and two scores in the win over the Salthawks last week. Meanwhile, Greg Slade has the Campus Colts moving in the right direction. The Colts finished 5-5 last season and earned the schools’ first ever playoff victory. Campus kept the momentum going with a dominating win over Dodge City to open the season. Last week, the Colts got by a much-improved Newton team, 29-20. After graduating all-state selection Federico Harvey, Wichita South transfer Evan Kruse has transition well into the Colt offense. It certainly doesn’t hurt to have talent like Tyler Kahmann, Cameron Harvey, and Quinton Hicks to distribute the ball to, and Seth Falley up front leading the way. Kahmann is one of the state’s top three-sport athletes, while Harvey put up incredible all-around numbers last week. Against Newton, Harvey had 98 rushing yards, 10 tackles and an interception on defense, and returned a kickoff 91 yards for a score. Hicks is a South Dakota State football commit, and if all goes as planned, would eventually wear the same colors as Grill, who has also committed to the Jackrabbits to play basketball at the next level. This year marks the third straight matchup between Great Bend and Wichita Northwest. Before then, the teams had not faced each other since 1980, according to kansasfootballhistory.com. Great Bend has opened 2-0 with quality wins against Andover (35-12) and longtime rival Hays High (15-7). The Panthers have allowed 23 points per game each of the last two years, including 39 in the first two contests last year. In Week 3 last season, Great Bend fell, 63-27, to Northwest. Senior quarterback Koy Brack is in his second year as the starting quarterback. He has completed 27 of 45 passes for 343 yards with two scores against two interceptions. Great Bend has averaged 6.1 yards per play, just above last season’s pace of 5.8 yards per play in a 5-4 finish. Two years ago, in coach Erin Beck’s first fall, the Panthers went 10-2, defeated Wichita Northwest in the regular season, 58-47, and averaged 7.2 yards per play. Junior Gage Fritz, Brack and junior Dalton Miller have split time in the running game. Fritz has 18 carries for 117 yards and one score. Brack has rushed 36 times for 116 yards and three TDs, while Miller has 11 carries for 113 yards and a touchdown. Juniors Alex Schremmer and Payton Duvall have transferred in from Hoisington and Ellinwood, respectively. Schremmer and Duvall were both strong basketball players for the Panthers last winter after they came to the school district. Schremmer has 14 catches for 243 yards and two scores. Duvall is second with eight grabs for 81 yards. Senior Blake Penka has 21 tackles, while Miller is second with 15. Miller, the rare big class player who excels on both sides, has started on defense since he was a freshman. In his career, he has 110 offensive touches for 746 yards and nine scores and recorded 243 tackles and eight interceptions. Northwest has averaged 50 points a game in ’16 and ’17 and is off to another strong start this season with a 23-22 last-second victory against City League rival Bishop Carroll in Week 1 and a 56-0 win versus Wichita East last week. The Grizzlies had a substantial defensive improvement last fall en route to a 10-2 season and are on pace for another scoring defensive drop this year. Week 2 marked the first shutout for the Grizzlies since a 43-0 victory against Wichita North in Week 7 of the 2013 season. Junior quarterback Reagan Jones, a first-year transfer from Andover Central, has completed 23 of 39 passes for 350 yards with six touchdowns against one interception. Senior Breece Hall, an Iowa State commit, has 27 carries for 187 yards and a score. Jones has rushed for 89 yards and three TDs. Northwest has averaged 6.8 yards per play. Senior Marcus Hicks, an Oklahoma commit, has 17 tackles and 10.5 tackles for loss with 3.5 sacks in two weeks. The 6-foot-6, 245-pound Hicks had a first team all-state season last fall with 19.5 TFLs. Senior Josh Carter is second with 12 stops. Carter has 286 tackles with 27 for loss in his career. Great Bend has shown improvement on both sides and has Miller and Brack, two of the better 5A players. However, Northwest’s defense, led by Hicks and Carter, is matching its elite offense. Northwest’s overall talent leads to a victory. A ranked showdown between Big 7 Conference foes will take place in Sabetha on Friday night. Fifth-ranked Perry-Lecompton will travel to second-ranked Sabetha in a key game in the eastern half of Class 3A. Sabetha captured the Class 3A state championship a season ago, finishing with a 13-1 record. Two of those thirteen victories came against Perry-Lecompton. The Bluejays defeated the Kaws 28-21 during the regular season, then eliminated the Perry-Lecompton 28-6 in the second round of the playoffs. In that playoff meeting, Sabetha rushed for more than 440 yards and held Perry-Lecompton to 39 rushing yards on 32 attempts. This season, Perry-Lecompton looks like a team that can make a run and opened a lot of eyes after a 46-0 shutout of Holton last week. Led by standout quarterback Dalton Kellum, the Kaws have opened the season with 114 points while allowing none. Kellum has rushed for 365 yards and six touchdowns in the first two games. As a junior last fall, Kellum rushed for more than 2,000 yards and passed for 1,400 more yards. But the Kaws have other weapons on offense. Blaine Pattin has more than 150 yards and three scores this season, and Colton Mallonee has big-play capability outside at receiver. Meanwhile, Sabetha returns several starters from last year’s title run. Gabe Garber has transitioned to the quarterback position, and benefits from a backfield that includes returning starts Joe Gruber and Mason Engelken. The Bluejays rushed for nearly 400 yards in the season-opening victory over Nemaha Central, then added another 300 yards on the ground in last week’s 55-0 win over Riverside. The line is led by all-stater Elliott Strahm. Garber, an all-state selection as a linebacker on defense a season ago, is back as the team’s leading tackler. In both meeting last season, Sabetha was able to slow Perry-Lecompton’s ground game and make them one dimensional. If that happens again, expect a similar result. In Central Kansas League play, Pratt looks for its first victory against Hesston in at least 40 years. This marks the first matchup between the teams since ’15. Hesston won six straight from ’10-15, including close margins of seven, 16, 10 and seven points. Those are believed to be the only matchups between the teams since 1978, according to Kansas Football History. For the third straight week, the Greenbacks have a high-profile CKL contest. Pratt has enjoyed impressive wins at Hoisington (34-0) and versus Halstead (32-16). Pratt bumped Hesston from the top-5 3A rankings. The Swathers have held strong after a preseason camp injury to quarterback Cameron Cox. Backed by a veteran offensive line and all-state running back Parker Roth, Jacob Eilert has stepped in and played solidly under center. Hesston has beaten Pratt, 42-36, and Larned, 28-21. Pratt senior Travis Theis has moved from running back to quarterback and continued his torrid production. Theis, with more than 4,500 career rushing yards, has 29 carries for 433 yards and seven scores. He ranks second to Wichita North running back Joe Williams in the state for rushing yards, according to MaxPreps. Last year, Pratt ran the ball on 88 percent of snaps and averaged 8.6 yards per play. This season, Pratt is again at 88 percent run with 9.9 yards per play. In the preseason, Pratt’s trio of Caden Blankenship, Kadence Riner and Brett Winsor were expected to emerge as key offensive players. They have combined for 30 offensive touches for 375 yards and two TDs. Senior Jadon Koehler leads with 17 tackles, and Theis is second with 16 stops. Entering this year, Koehler had recorded 20 stops in his career. Pratt is 21-3 since the start of 2016. Last week, Hesston trailed Larned, 14-6 at halftime, before 21 unanswered points. Larned, like Hillsboro in Week 1, scored late to draw the final margin closer. In the first half, Eilert threw a 24-yard touchdown pass but then had an interception followed by a pick-six with 65 seconds left before intermission. Larned opened the second half with a fumble lost at its own 36-yard line. Roth eventually scored from three yards out for Hesston to tie the score with 8:38 remaining in the third quarter. Hesston had another interception that Larned’s Mason Perez returned to the Swather 43-yard line. However, Hesston’s defense held, and Eilert responded with a four-yard touchdown run. Hesston added another score on a 30-yard pick-six from Max Arnold early in the fourth quarter. After Larned’s late score, the Indians did recover an onside kick but couldn’t convert a 4th-and-20. Cox is expected to miss ample time this season with a knee injury. Both teams are loaded with talent and experienced players, but Pratt’s depth at the skill positions leads to a win. It has been 21 years since Riley County last claimed a portion of the Mid-East League title; sharing it with Silver Lake in 1997. The Falcons last win over Silver Lake came in a 28-20 decision back in 1996. Last season, the Falcons and Eagles were both unbeaten when they met to decide the MEL title in Week 6. After a scoreless first quarter, Silver Lake scored three times in the second quarter to lead 20-7 and eventually pulled away for a 41-14 victory. On Friday, the Falcons and Eagles will meet in Silver Lake in a game that could, once again, decide the league title. Riley County is coming off of a wild 26-21 victory last week over Centralia. The Falcons led 18-7 until consecutive fourth-quarter Centralia scores gave the Panthers a 26-21 lead with five minutes to play. Riley County would answer on a Mikey Waggoner touchdown reception from quarterback Garrett Harmison with more than two minutes remaining. The Falcon offense is led by Waggoner, whose late decision to come out for football his senior year may be the key to Riley County’s season. Waggoner led the Falcons with more than 1,000 yards rushing and 13 touchdowns last season in addition to being the team’s leading tackler. Harmison has stepped well at quarterback having thrown for 400 yards and four scores in the first two games. Silver Lake enters Friday’s contest coming off another victory in the “War on 24” with Rossville. The Eagles held a 10-point lead in the fourth quarter before holding off the Bulldawgs, 17-14. Christian Stoner rushed for 166 yards and a touchdown, and Mason Griffin passed for 168 yards to lead the Eagles in the victory. After a Rossville score closed the gap to 17-14, a Silver Lake fumble set up the Bulldawgs in great field position. Rossville eventually missed a potential game-knotting field goal. A highly anticipated matchup since the summer, this could be the first of two meetings between Rock Hills and Hanover. Administration from both schools looked to put the contest together to provide a quality matchup for the teams. Hanover, the two-time defending Division II state champions, has won 27 straight contests, tied for Bishop Miege for the state’s longest current run. Last fall, Rock Hills finished fifth in the final poll after the Grizzlies played Hanover close in the first round of the playoffs. Rock Hills trailed by two at intermission before the Wildcats pulled away for a 64-32 victory. However, the Grizzlies will likely miss significant players, including quarterback Dereck Gillett and running back/all-purpose threat Rylee Whelchel. Both played last Friday. Hanover returned plenty of talent, including all-state quarterback/defensive back Daiken Stallbaumer and all-state running back/linebacker Carter Bruna, along with all-purpose threat Thomas Atkins. 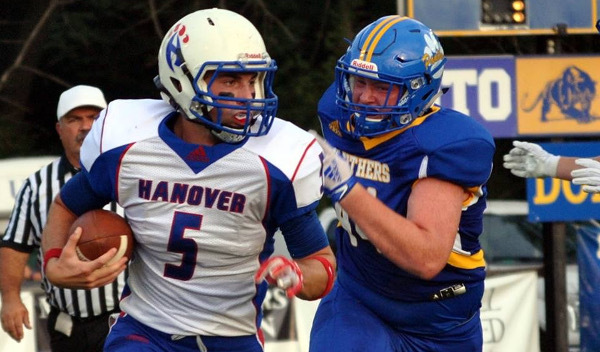 Hanover has plenty of size and depth up front, namely with returning starter Jonah Weber. The Wildcats have opened with two road wins versus Pike Valley, 46-0, and eight-man newcomer Doniphan West, 52-6. Rock Hills had a forfeit Week 1 win against Blue Valley Randolph and then won 52-0 at Lakeside-Downs. Gillett completed his only pass for a 17-yard touchdown. Senior Zane Colson, a four-year starter and one of the state’s top players, had 13 carries for 150 yards with a score. Overall, Colson recorded 242 all-purpose yards and led with five tackles. Whelchel had four rushes for 63 yards and a TD. Sophomore Mason Higer, expected to be a key contributor entering 2018, picked up two sacks. Sophomore Jerrod Gillett caught the only reception. Rock Hills is 10-1 in the last 11 regular season contests. This was expected to be a marquee game, but Rock Hills, without key players, will have a tough time versus Hanover. 8M-I No. 4 South Central (2-0) at 8M-I No. 3 Hodgeman Co. (2-0) – Hodgeman Co.